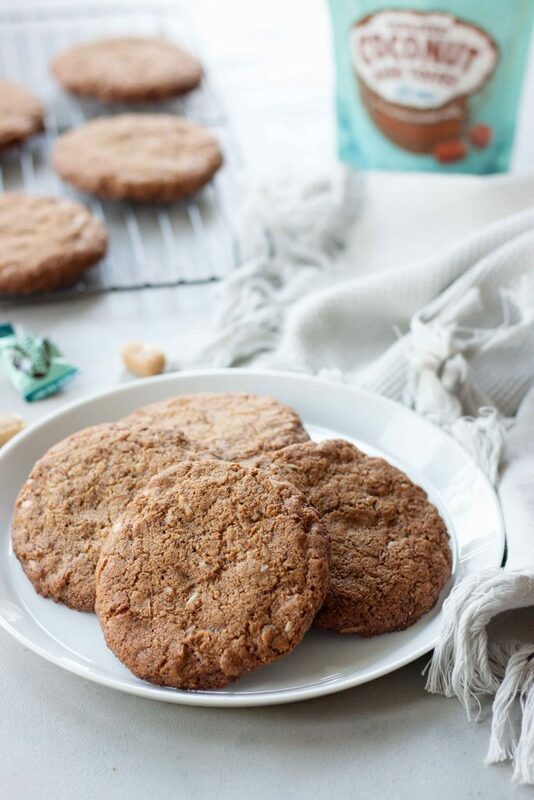 There is more to life than chocolate chip cookies, Toasted Coconut Toffee Cookies! They are even gluten free, grain free, dairy free, and vegan friendly! Maybe paleo but I’m not an expert on that so I can’t say for certain. Either way these cookies will blow your mind and taste buds! Simple to make, 10 ingredients, and they are so soft and chewy. I use to remember getting these coconut toffee cookies at a bakery up near our cabin as a kid. There was just something about those cookies and I always wanted those over chocolate chip cookies. Not that I didn’t like chocolate chip cookies but there was something special about those cookies. They were pretty pale, chewy, and were sprinkled with coconut and toffee bits. I’m not even sure if they had flour in them. Haha. 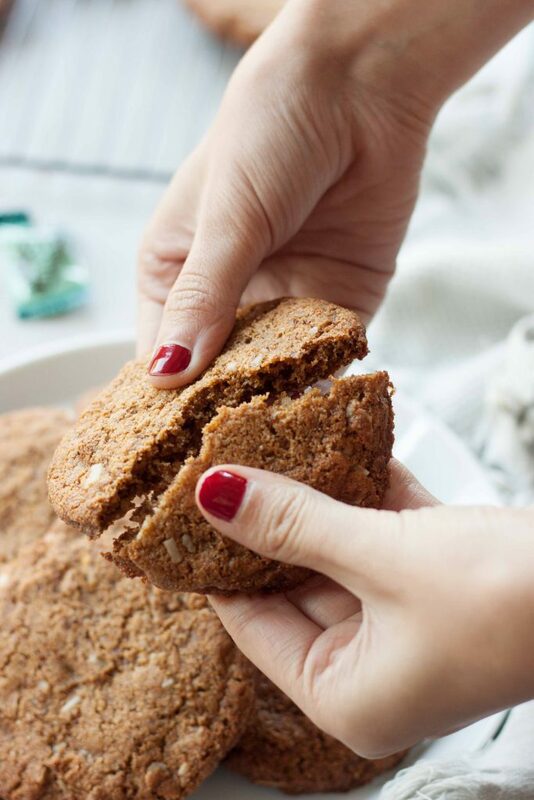 It’s rainy and chilly and in a baking mood, plus craving all the comfort foods this week so I’m whipping up more of these Toasted Coconut Toffee Cookies I’ve been making for the girls. 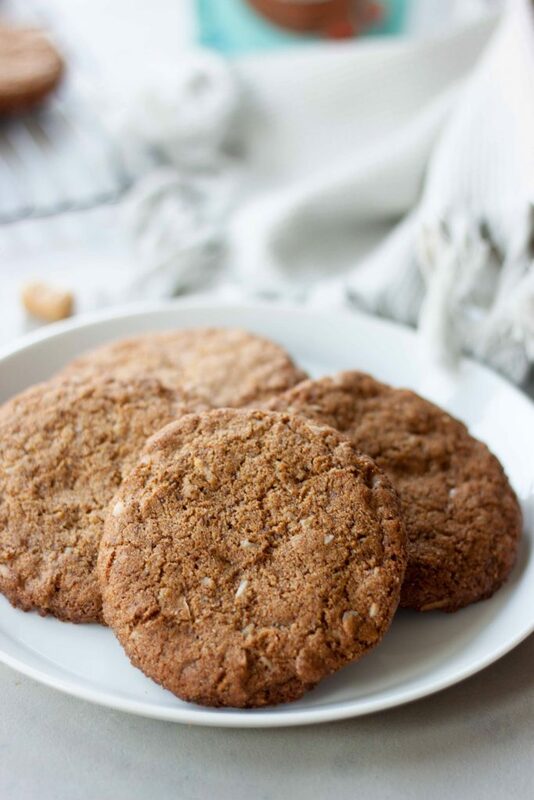 I had plans of making caramel apple cookies and these were an accident that happen and 3 batches later and not making any the girls loved I decided to go back to the ones they loved and stick to the apple oatmeal breakfast cookies that aren’t pretty but are pretty delicious. 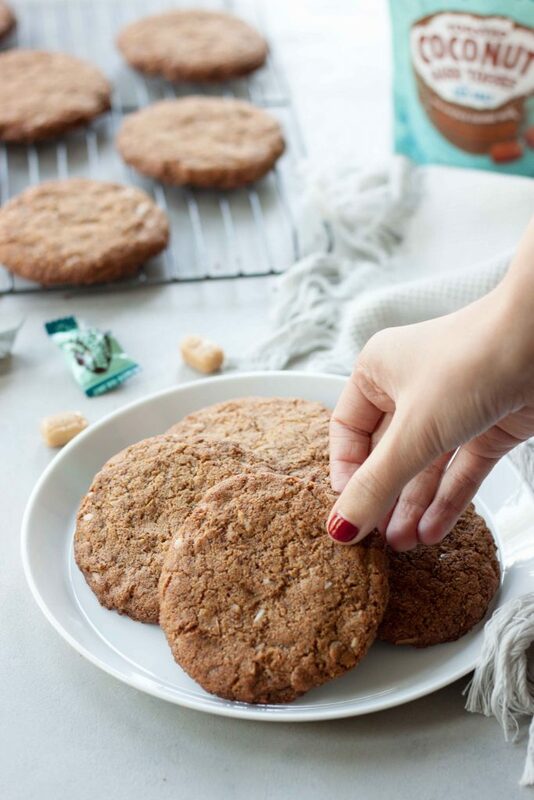 It’s kind of funny because it was déjà vu to Caramel Coconut Espresso Almond Butter Cookies I made last year. Of course making batches with plain almond butter for the girls. I made batches trying to get those cookies chewy and just perfect and they were a favorite. Those cookies are thinner, chewier, and have more texture. These we were going for soft chewy cookies, with apples and caramel but as I said sans apple. They do pair perfectly with a cup of warm apple cider though! I had planned on sharing these cookies earlier but with the computer crash I thought I would have to re-photograph them, oh darn make more cookies? Just then my husband saved the day and got my photos, and it wasn’t easy with so many raw files. I already told the girls I was baking cookies so I guess I better. The apple recipe I shared a sneak of this past weekend I was going to share today will wait. While I know these aren’t the healthiest cookie I would consider them a healthy treat. A balance between healthy and those rich sugary chocolate chip cookies I grew up on. Nothing wrong with that because 80/20, 90/10, (sometimes more like 50/50, hey holidays and vacations) it’s all about finding that healthy happy balance between feeling good, living life to the fullest, and enjoying life. Made with almond and coconut flour they are gluten free, grain free, and pretty filling. Coconut oil and almond butter in place of butter, and coconut palm sugar in place of refined brown sugar and cane sugar. Yes still sugar but in contains amino acids, potassium, magnesium, zinc, iron and B vitamins. Plus it’s a low-glycemic option. Hey it’s a cookie and sometimes you just need a cookie and this is one of those weeks. 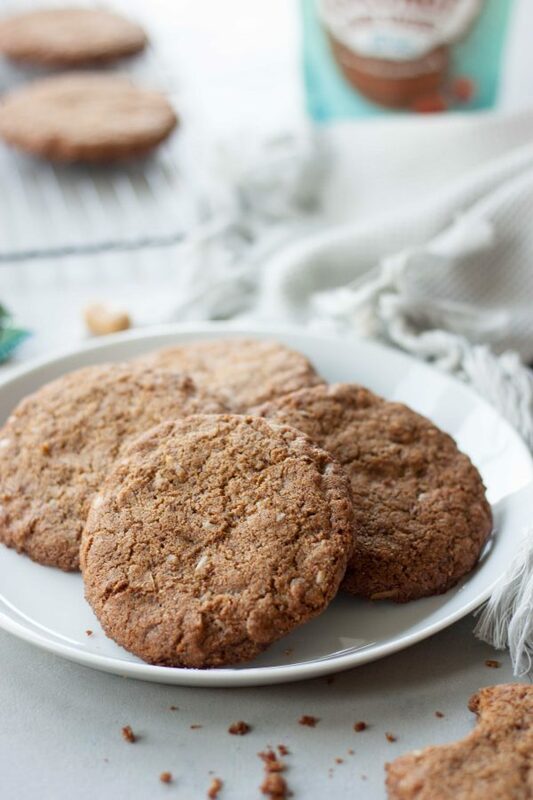 There is more to life than chocolate chip cookies, Toasted Coconut Toffee Cookies! They are even gluten free, grain free, dairy free, and vegan friendly! These cookies will blow your mind and taste buds! Simple to make, 10 ingredients, and they are so soft and chewy. If wanting to toast your coconut, which I highly recommend, spread coconut out on a rimmed baking sheet and place in the oven watching closely and mixing once after a couple minutes. It will only take a few minutes and you just want to lightly toast it. Let coconut cool while preparing the rest of the cookies. Cream together almond butter, coconut oil, sugar, and vanilla with a hand mixer. Blend in egg until just blended. Run a knife through coconut, optional but this helps with the texture while keeping the flavor. In a bowl combine almond flour, coconut flour, baking soda, and coconut. Make sure to spoon the flour into your measuring cup or sift so you don't over pack the flour in the measuring cup. Add the wet and dry ingredients together just until combine. Stir in caramel candy pieces. If the dough is too oily to roll into cookies because it is warm place in the refridgerator for 10-15 minutes before rolling. Line baking sheets with a Silpat mat or sheet of parchment paper. Spoon or roll cookies into a ball with your hand, they will be a little wet, and press slightly flatten a little. Place on baking sheet about an inch a part. Ooh I bet the almond butter is great in there! OH I love coconut! I have a lot of coconut flour and often make muffins and pancakes with it but I haven’t tried cookies!